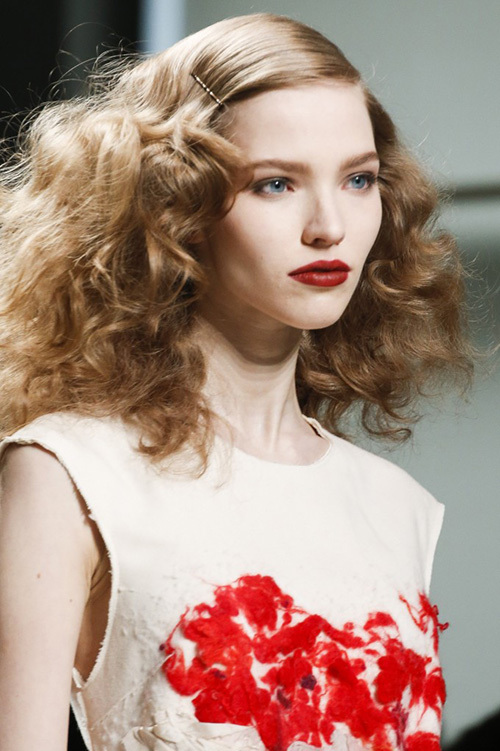 Get big, beautiful, runway-ready hair like the model at Bottega Veneta’s fall 2013 show. If you have the type of fine hair that falls flat after a few hours and won’t hold a curl, humid weather can leave your style looking deflated (cue the sad trombone). Try these tricks for every styling stage for volume that lasts through anything — even sauna-like heat and humidity. Choose a volumizing shampoo that won’t dry out hair. Pureology Pure Volume Shampoo ($27) and Condition ($29, pureology.com) remove buildup that can weigh down hair and thicken strands with flexible volumizers. Before you blow dry, prep hair with product to boost volume at the roots and on the lengths to coat and thicken strands. Apply Kérastase Paris Lift Vertige Root-Uplifting Gel ($36, kerastase-usa.com) directly to your comb to create lift at the scalp. Rake a lightweight mousse, such as Vidal Sassoon Pro Series Boost & Lift Foaming Air Mousse ($3.99, target.com), through the rest of your mane to plump up individual hairs. Blow dry with a large round brush to give hair maximum lift. Aerosol sprays are a quick fix for volume that’s fallen flat. Think of Oribe’s new Thick Dry Finishing Spray ($37, oribe.com) as the sequel to the brand’s cult favorite Dry Texturizing Spray; the new product has a finish that’s soft enough to use all over hair, not just on the roots. Bumble and Bumble Thickening Dry Spun Finish ($29, bumbleandbumble.com) is an ultra lightweight formula that gives hair airy fullness without leaving a white residue. Don’t want to fog up a room? Instead of a spray, try Shu Uemura Art of Hair Volume Maker ($48, shuuemuraartofhair-usa.com) an invisible powder that’s applied directly to roots with a brush applicator — like oil-blotting face powder for your hair. The right cut can make all the difference between hair that looks lush rather than stringy. Blunt-cut ends and minimal layers can make hair look fuller, while razored tips can make fine hair seem straggly. Want an added lift? L’Oréal Professionnel salons now offer three customized Volumceutic treatments with options available for normal, color-treated and damaged hair that boost hair’s volume for up to three days. The service removes buildup with salicylic acid (yep, the same ingredient we use to de-gunk pores) and features patented Intra-Cylane technology that acts as a filler at the heart of the hair fiber to densify strands. Head home with products prescribed from your stylist from the new Volumetry line to keep your volume turned up for days. Find a salon at LPsalons.com.